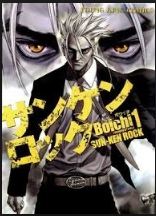 Sun Ken Rock: Manga-Chapter 1steemCreated with Sketch. Manga written and illustrated by Boichi. CHAPTER 1: He shows Ken the protagonist of this story, where at the beginning he clarifies that when he was little he had a family and dreams, but everything changed when he lost his family and as a result of this his dreams. The only thing he had left was the love he felt for a girl from another class named Yumi, when he confessed his love for her, he was rejected with the excuse that she would go to Korea to be a policewoman there. One year passes Ken is still aimless and learns that Yumin (who is Korean and is his real name) has become a great policeman, this leads to wake up his excitement of going to Korea to be a policeman to be with the woman who loves Being there for a year sees that everything goes from bad to worse since he has no money, nothing to eat and being in a small room, dirty and without any work. When he sees that everything is lost, he goes to a food store and the old owner of this place gives him a plate of food and while Ken was there, some gangsters ended up with the local, beating the man forcing him to give him money that he does not possess, this leads to the wrath of ken and defeats them all swearing that he will protect the old man and while this happened he was being observed by a kind of organization saying that it is good and they need it.